David Price believes he is in peak condition ahead of his comeback this weekend at the Brentwood Centre on MTK Global’s ‘Pride & Glory’ fight bill. Liverpool heavyweight Price (21-4, 18KO) returns to the ring on Saturday night as he headlines an action-packed card, which will be streamed live on iFL TV (via this link from 6pm). The former British and Commonwealth champion is set to take on Polish journeyman Kamil Sokolowski in what will be his first bout since suffering a stoppage loss to Christian Hammer last February. Having boxed less than four rounds in the year prior to that defeat, Price is eager to clock up some ring time as the 34-year-old looks to add a competitive edge to his fitness. “I’m feeling sharp and my training has gone really well,” said Price. “To be honest, I’ve never looked forward to a fight as much as I’m looking forward to this because everything has gone so well in training and I’m feeling really good. “I’ve dropped a bit of weight and I feel in great shape, so I’m looking forward to getting in there and getting some rounds. Now managed by MTK Global, Price this week admitted that he is keen to build towards a 2018 battle with former amateur rival Tyson Fury after the lineal world heavyweight champion recently signed an advisory deal with MTK. The 2008 Beijing Olympic medallist contemplated retirement following his loss to Hammer, but his training under coach George Vaughan, alongside Derry Mathews and Joe McNally, in his native Liverpool has given him renewed hunger to climb back towards world level. “I was undecided at one point, but not for long, just a couple of months. I wanted to get back in after the summer, in September, but that fell through because I was ill,” said Price. “I just wanted to get in and get a fight under my belt so next year I’ll be ready to open doors to bigger fights. While Sokolowski carries a modest 4-11-2 record, the Pole caused an upset against Dubliner Seán Turner last April and Price hopes his opponent will provide a challenge this weekend. 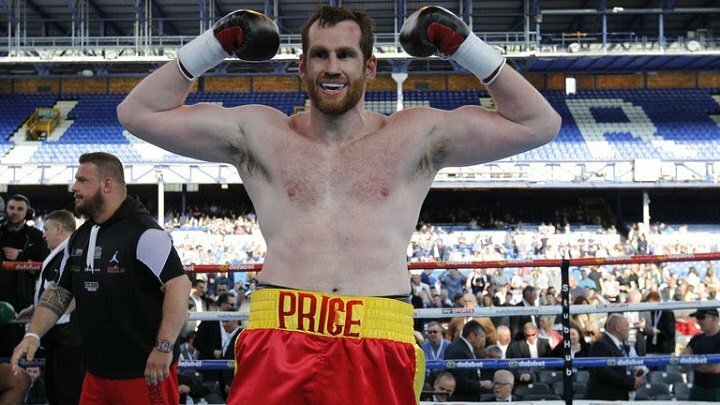 David Price hopes a comeback victory on Saturday night (December 2) will be the first step towards a long-awaited grudge fight against lineal world heavyweight champion Tyson Fury. Liverpool heavyweight Price (21-4, 18KO) returns to the ring this weekend at MTK Global’s ‘Pride & Glory’ fight night, which will be streamed live on iFL TV (YouTube channel) from the Brentwood Centre in Essex. Topping the bill in his first bout since suffering a stoppage loss to Christian Hammer last February, Price makes his comeback against tough Polish journeyman Kamil Sokolowski. The 34-year-old former British and Commonwealth champion believes a pre-Christmas victory will tee up a big 2018 as he aims to get back into the mix with the world’s top heavyweights. Price is managed by MTK Global and with his old foe Fury having recently signed an advisory deal with MTK, the Liverpudlian hopes a fight can be made between the pair in 2018. Price defeated Fury as an amateur and the pair traded words over social media recently as both men suggested they would be keen on finally clashing in the paid ranks. “If that’s something that Tyson Fury is serious about, I’d love the opportunity to finally get in the ring again with him and put the rivalry to bed,” said Price. “You have to be realistic, though – he’s the lineal heavyweight champion and I’ve got to prove my worth. “I’m sure I’m going to do that in the next couple of fights and the heavyweight division is changing all the time. A few fights down the line, a fight against Fury would be massive for boxing again. I just have to get my name back out there again with a good couple of wins and it will capture the publics’ imagination,” continued the 2008 Olympic medallist. Price headlines a busy night of action on Saturday night as 16 bouts feature on the ‘Pride & Glory’ bill, with seven MTK Global fighters in action.